Usually the voice in my head is too busy singing Poison songs to get involved in my cooking process, so I figured I better listen. If nagging inner voice can take a break from “Every Rose Has Its Thorn” on endless repeat for hours at a time, this must be important! So I went with peaches. Again. I promise, next summer will be the summer of blueberries. Blueberry everything! All summer! You have my word. And my word? It’s gold. If you’ve been reading Oh My Veggies for a while, maybe you remember my Sweet Potato French Toast Cups recipe. I wanted to do that again, but with fruit. The thing I love most about making little individual French toasts in muffin tins is that they’re portion-controlled and easy to freeze. Bake ’em, freeze ’em, and heat ’em in the microwave for breakfast. It doesn’t get much easier than that. 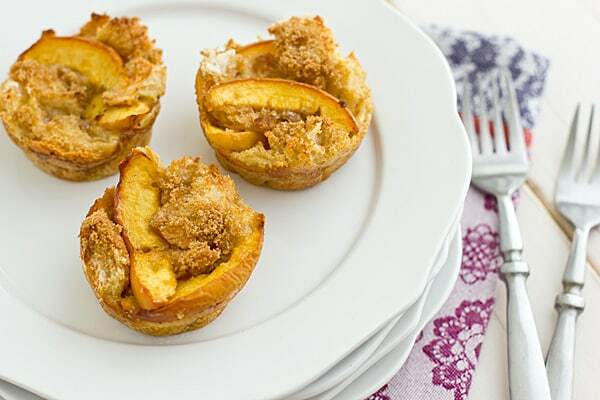 Unlike the sweet potato version, these Brown Sugar Peach French Toast Cups are sweet enough that you don’t need to add syrup or sauce. With the dusting of brown sugar on top, they’re perfect on their own. Kids can even pick them up just like muffins or cupcakes, which makes them a great back-to-school breakfast. Since summer is almost over and peaches won’t be in season much longer, you can substitute apples or firm pears for the peaches. And yes, you could even do blueberries or blackberries. Versatility? These French toast cups have it covered. Perfectly portioned French Toast Casserole! These little French Toast Cups can be prepped the night before and baked in the morning. They’re so sweet and flavorful, you don’t need to add any syrup. Spray a muffin tin with cooking spray or oil. Divide bread and peaches evenly among all 12 muffin cups. You might have to smash them down a little bit to fit them in, but that’s okay. Beat 3 eggs in a medium bowl. Whisk in milk, half-and-half, vanilla, cinnamon, and 3 tbsp. brown sugar. Use a ladle to pour egg mixture over bread and peaches. Cover muffin tin with plastic wrap and refrigerate for at least 2 hours, up to overnight. Preheat oven to 325 degrees. 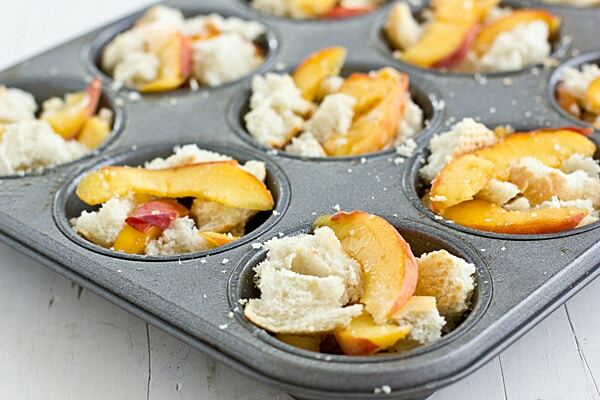 Remove plastic wrap from muffin tin and use a spoon to push bread and peaches down into the egg mixture. Sprinkle tops with remaining 2 tablespoons of brown sugar. 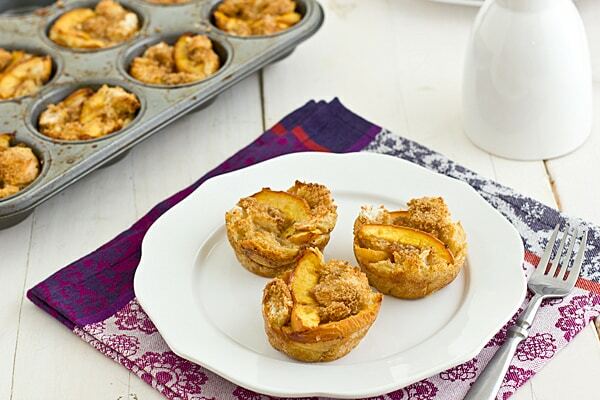 Bake for about 35 minutes or until French toast cups are set and edges are golden. Loosen cups by running a butterknife along edges before removing from muffin tin. Prep time does not include time in refrigerator. 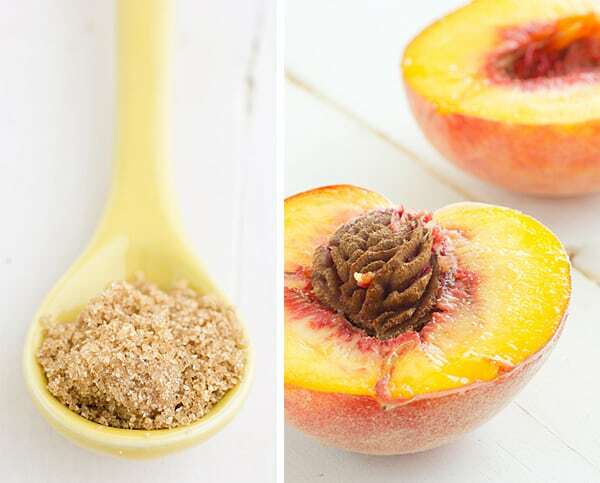 I LOVE peaches, so use them in whatever you want!!! These look so good- I’m surprised by how easy they sound too since they look super impressive! I know, I love peaches so much too–I will be really bummed when they’re out of season! These are definitely easier to make than they look, although they do require a little bit of prep time. I don’t know if this should be dessert, breakfast, or both! After seeing the second picture I was waiting for a ‘Pour Some Sugar on Me’ reference. Then of course I realized you said Poison and not Def Leppard. But if you love Vanilla Ice and find yourself singing Poison all the time then surely I have found another DL fan, right? Either that or it is late and I should stop talking. Thanks for the recipe. The kiddos will love these and they seem simple enough that even I can’t mess than up. OMG Rachel, “Pour Some Sugar on Me” is one of the songs in constant rotation in my head. How about the epic Eddie Murphy/Rick James collaboration, “Party All the Time”? Because that is in my head constantly too. Also Bon Jovi. Lots of Bon Jovi. And Bobby Brown. I am glad I am not the only one whose soundtrack for my life consists of obscure references and big hair bands. I taught Party All the Time to my 6 year old just this week. You’re a good mother. Every child needs to know about Rick James. Neva 4-get. These sound so fabulous! And you won’t hear any complaints from me about peaches (my favorite summer fruit :-)). These look so pretty!! I want a couple right now! Yum! I like the idea of freezing a bunch for later too. And I would totally choose peaches over blueberries or blackberries. I will freeze just about anything! When you’re cooking for two, it’s nice to throw the leftovers in the freezer for another day (or week). I think I need to go make these, right now! What fun mini French toast bites! This sounds awesome! Easy and Yummy, the perfect combo! This might also be awesome with apples, but you might have to pre-cook the apple a little first. Thanks for sharing this recipe!